Choose a Mounting Width 67"-72"	73"-78"	79"-84"	85"-90"	91"-96"	97"-103"
We've been making and selling biminis for nearly 20 years now and this product is surely one of our finest! THIS LISTING IS FOR A COMPLETE KIT. THIS BIMINI TOP IS 8' LONG AND 60" HIGH FROM THE MOUNT UP. Introducing our incredibly awesome looking Stealth Camo Bimini Tops. On a scale of 1-10, THIS TOP is a DEFINITE 10! Available in Mossy Oak Shadow Grass or Mossy Oak BreakUp patterns. One of the most exciting features of this top is that it comes standard with a 7/8” diameter Heavy Wall Anodized (corrosion resistant) Aluminum Black Matte frame and High Grade heavy duty Black Nylon fittings to match. This frame has a Double Wall main bow construction for added strength. The combined fabric and frame make this top an excellent choice for the avid hunter or for the boater that simply likes camouflage. The fabric is 7 oz. Marine Grade Polyester and is extremely strong. This polyester fabric is durable and water repellent. With anti-fungal and anti microbial treatments make this fabric look great and last for years. The fabric and the thread used to construct it contain UV inhibitors for even greater product protection. We use anti wick thread throughout our camo tops.The edge binding used to "clean up" the seams and prevent them from unraveling is made of 100% marine grade acrylic. There are no "raw edges" on our tops. NOTE: Top in pictures is shown with optional rear support braces which are NOT included in this listing. Top comes with standard forward and rear tension straps. Comes with a Full 5 Year Warranty and it's MADE HERE in the USA ! These tops are made as ordered. Please allow an average of 2 weeks for manufacturing plus shipping time from South Carolina to you. NOTE: The price you see here is the same price your local dealer will pay us for this top! Mossy Oak is a trademark used under license from Haas Outdoors, Inc. by Carver Industries, Inc .Our products: Official licensed product of Haas Outdoors, Inc., West Point, MS 39773. 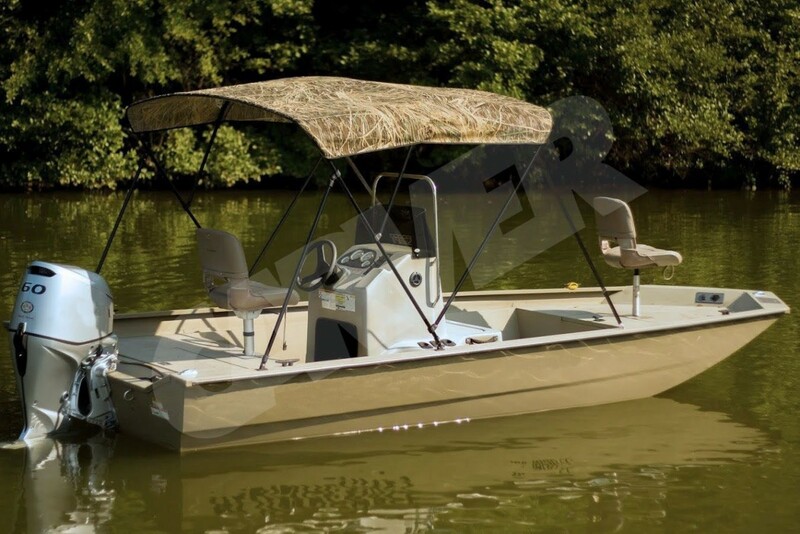 Manufactured and distributed by Carver Industries, Inc.
Click the button below to add the Camouflage Bimini Top With Black Frame COMPLETE COVER KIT (8' Long 60" High) to your wish list.